Possibly the new Spellfire/Frozen Shadoweave sets? Just haven't been given stats, and a mage qualification for whatever reason. Blizzard posters have already said they regret implementing the Frozen Shadoweave set in game, simply because it was too well itemized for such an easy-to-get set. So probably, no. This is not the new Frozen Shadoweave set. Well, if you also look at the robe, there's a warlock requirement on it. Imo it's just a placeholder until they get everything straightened out. it will be like the Spellstrike, etc set, just updated for Wrath. An example of the Wowhead Comment Correlation Effect. 1) The more comments the more likely the item is good for something. People will fight back and forth over the details. 2) few comments means few people think it is worth noting. This item is so weak compared to the other craftable gloves that this is the second comment made on them since beta. More or less these only offer haste. Nice, but frankly the +hit or raw stats of the other two set's gloves will help you more. 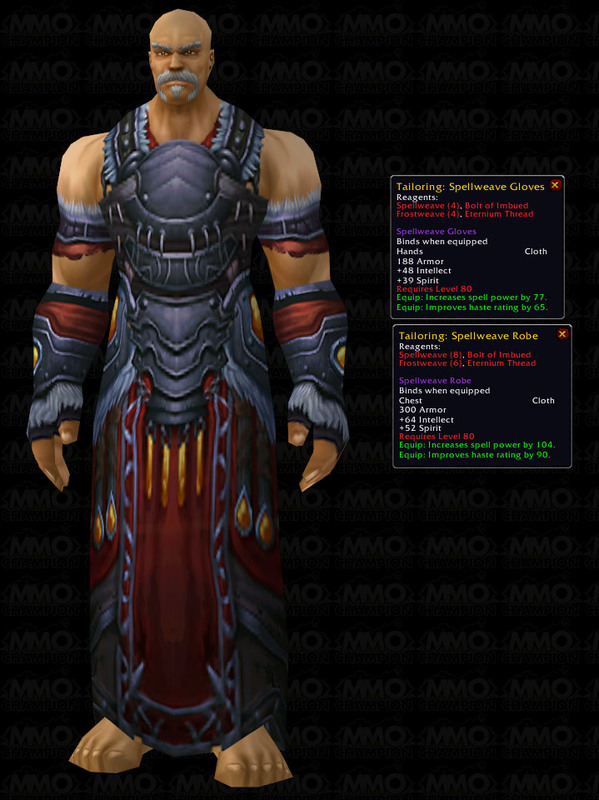 Of moonshroud, ebonweave, and spellweave gloves & robes, the spellweave stuff is the best for priests imho. No wasted points on stamina, and haste is good -- well, useful anyway -- for either dps or healing. These gloves are cloth, but EXTREMELY well itemised for a new-to-lvl-80 tree druid - they have exactly the four key stats a tree is looking for in it's gear, and are crafted, which means relatively good availability. The only other crafted hands suitable are blue Overcast Handwraps, which are intended for PvP and not PvE. Actually, these are best tree druid hands you're gonna see until you get lucky in FoS and get Essence of Desire or until you buy the iLvl232 T9 gloves.